You know what smell I never get sick of? The smell of peanut butter baking in the oven and the anticipation of it soon filling my belly. If you’ve been around a while, you’ve seen the incredibly easy Flourless Peanut Butter Cookies. I’ve also made a similar recipe for Peanut Butter Oatmeal Cookies that is a little less sweet but more stable. But you can’t beat the crumbliness of these flourless cookies, they simply melt in your mouth. These cookies are a cinch to make but manage to disappear even quicker. 1. Preheat oven to 350 degrees. Mix all ingredients through cinnamon in a medium bowl. Then, add the eggs and mix just until combined. 2. Roll into 1″ balls and place onto an ungreased cookie sheet. 3. Pour some raw sugar onto a small plate. Take a fork and touch the batter with the back of the fork, then press the fork into the raw sugar. Now, press the fork down into one cookie and press into the sugar again. Press down into the cookie in the other direction, creating a cross-hatch. Repeat for all cookies. 4. Bake for 10 to 12 minutes. I find the optimal time for my oven to be about 11 minutes. Once removed from the oven, let cool on the pan for 5 minutes before transferring to a wire rack to cool completely. Wow, these look heavenly. Very creative. I love pb cookies, but would never have thought to add cinnamon and raisins to them. My favorite thing on Easter was peanut butter related…I love putting pb on chilled sunday-morning pancakes. It’s ridiculously good. As for my event, you can send in upto 2 entries:) hope to see them soon! Thanks for visiting my site. I just had peanut butter on toast for breakfast, but oh how I wish I had one of those delectable looking cookies instead. Nothing wrong with starting the day with a cookie, right??? Ben, I love peanut butter on pancakes too, that’s how I always enjoy my own: Banana Pancakes. Peanut butter should be used in place of butter on everything. It’s a little different for baking, but usually if the amount of butter called for isn’t too much, you can substitute about 1 1/2 times as much peanut butter and it should come out pretty good if not better! Julie, There is absolutely nothing wrong with it! In fact, in the original Flourless Peanut Butter Cookies, I declared that 2 cookies were part of a balanced breakfast! Especially considering that most people use 2-3 packets of sugar in every cup of coffee in the morning, you could easily justify it. Ok, so I made the original Flourless Peanut Butter Cookies, they tasted wonderful, but they didn’t hold together good (crumbled). Do you have any ideas as to what I did wrong? I definitely will try again! The cinnamon sounds yummy, eeww, I don’t do raisins! I put your link up on my blog! Will you do the same with mine? Depending on the different brands of peanut butter, the cookies can fall apart. Try either increasing the sugar a bit or adding a little bit more egg, which is easy if you’re using egg substitute, simply add about 20-25% more egg. From my experience, if you undercook or overcook them they tend to be more crumbly. You want a nice browned botttom. Although a very dark bottom may hold together better, I’m not 100% sure. Experiment! Try cutting the recipe in 1/4 with added egg and a touch more sugar. I even cut it into 1/24 once and made only 2 cookies! Sure, your blog has been added to my blog roll =). just when I thought that peanut butter cookies couldn’t get any more indulgent and sensational, I stumbled upon your blog and found cinnamon-raisin peanut butter cookies – yum!! you’re brilliant! Looks delicious! They have a really golden color. . . yum. Yes, these cookies are as delicious as they look and should be made, if for nothing else, in the name of science….strictly research. One must taste this combo of flavors for themselves to truly understand its magnificence! 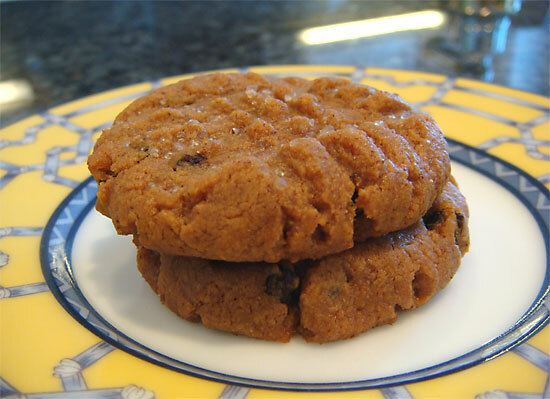 How wonderful to come across your peanut butter blog- these cookies sound great. I have a ‘date’ with peanut butter this weekend- any favourite recipe you care for me to try? Nick, thanks for stopping by my blog. I’ve always loved peanut butter, but cannot stand it in anything else, including cookies or candy. But these cookies look delicious and very tempting and I think I am going to try them. I spent last night dreaming about peanut butter cookies, so it was a pleasure to run into you this morning. YUM! They are delicious! I urge you to try them, divide the recipe by 1/24 if you want, it works great! Mmmm…. these look delish. Defo my kind of cookies. More, please! Hi there! Awesome looking cookies… never would have thought of the raisins :D. Keep it up! Just made these…yum! I recently found your blog and LOVE it! I am a huge PB lover and have been putting it in my oatmeal for years. Can’t wait to try everything else! Just thinking about baked peanut butter makes me hungry. YUM!